Readers, I have two articles out right now that I'm really excited about! 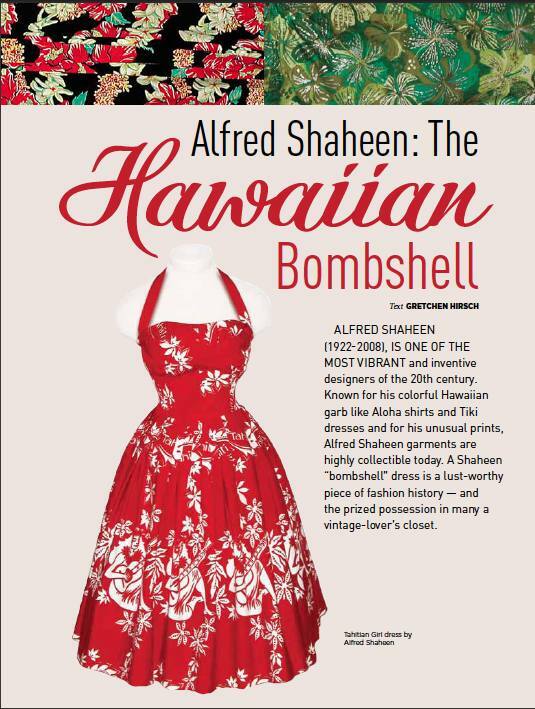 First, an article on Alfred Shaheen in the summer 2012 Stitch Magazine (of which I'm now a contributing editor--never thought I'd see my name on a masthead!). This article was a dream come true to work on. 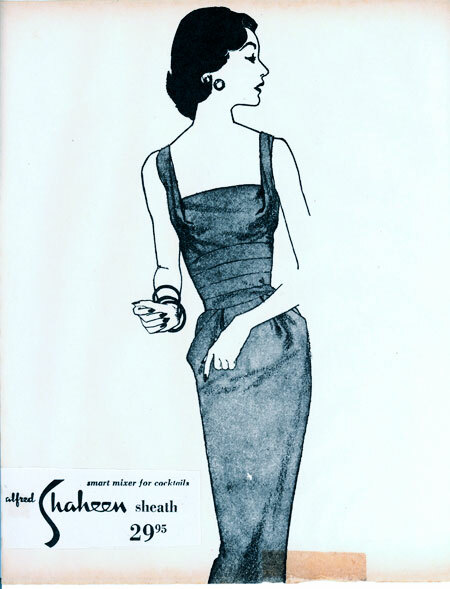 Shaheen's work was the inspiration for my bombshell course, and he's one of my favorite designers of all time. To write a profile on him, I ended up getting in touch with his daughter and having several enlightening phone conversations about her father's work, their family history, and the surprising way Alfred was influenced by his mother's work as a seamstress. I also learned one of the sewing secrets behind the icornic "Shaheen Sheath" (see below)--clever elastic stays in the bodice! 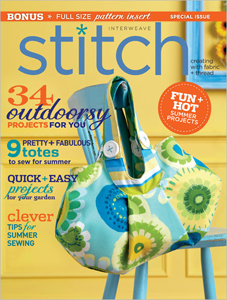 You can find this issue of Stitch in bookstores or you can order it online here. You'll also find some of my design work in SewStylish magazine! I was asked, along with fabulous sewing superstars Cal Patch and Christine Haynes, to design our own take on a new Simplicity pattern, number 1920. I used the blouse and skirt patterns to come up with a glam 50s-inspired ensemble. 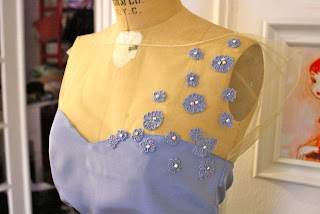 It has an illusion neckline (which you may remember me blogging about here and here!). 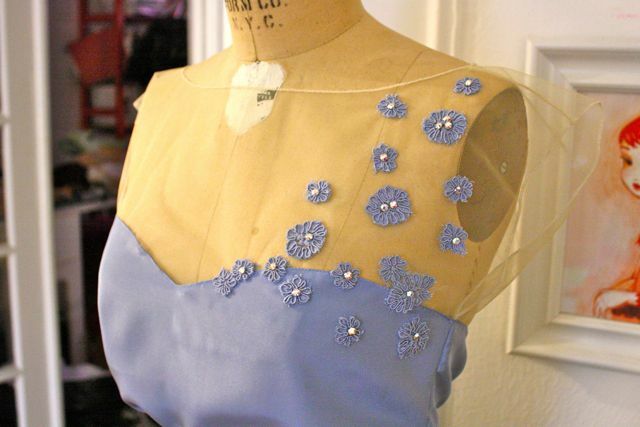 I sewed crystals onto lace appliques to get the scattered floral effect on the shoulder. Then there's a full skirt and a matching cummerbund belt. The tutorial for the belt is online here! Here's the whole look in my (old) apartment before I sent it off to SewStylish. I had envisioned lime green pumps, but they went with truly fabulous purple suede ones. SewStylish is now in stores, or available online here. I hope you will read and enjoy! Wow. That is an AMAZING interpretation of that pattern. You clever, clever woman. So pretty. So stylish with the illusion neckline! But what a pity, I live in Germany so I don't have probably the chance to get the magazine. Nevertheless, with your post I found sew daily, thank you for that. And I love your blog. How's the new house and the floor in your sewing room? So, last week I was flipping through Stitch at Barnes & Nobles and saw the Alfred Shaheen article. I was like, "Wow, that totally looks like something Gertie would loooove, I bet she will post about it." I "haha"-ed to myself when I saw you had actually wrote it! Great article, BTW. I really liked your look for SewStylish too! It made me sad that illusion necklines look so bad on me. I need to find someone who will let me make something for them with one so I can get the urge out of my system. Wow, leave it to you to take an apparently blah pattern (no offense Simplicity) and turn it into something beautiful and unique. Any chance we'll get to see more photos of that blouse? Wow, you are just spectacularly talented! The blouse is gorgeous! Well done Gertie! Have to agree with Claire, on how you took a ho-hum pattern to another level!!! Loving the neckline. After agonizing so much, have to ask what technique did you use? Its absolutely Fabulous Darling!!!! Just fabulous. Since I have that pattern, I will definitely buy the magazine... I have no clue how you can go from a straight skirt to the one you made!!! I can't wait to read your Shaheen article! I worked with Camille to bring the exhibit to my museum (AANM) in 2010. It was a spectacular show. Congrats! You, my dear are a Superstar! Well done. I really like what you made, will you be showing us just how you did that..would love to make one too. I would love to know if you will be teaching just how you made such a cute outfit. Very cool. I already have the one magazine and will now look for the other! Congrats Gertie! You are amazing!! Such a creative and cute take on the Simplicity pattern! Love it. Congratulations, Gertie! Can't wait to read your articles - you're the bees knees! Congratulations!!! You go grrrl!! So talented, beautiful work!! Congratulations! 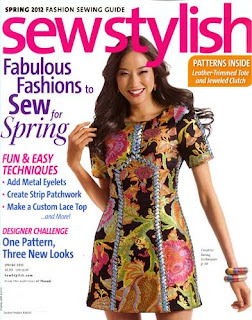 I saw the Stitch article, but I haven't received my copy of SewStylish yet. Brava and well done!!! O Gertie I just picked up SewStylish and saw your article. That dress is so gorgeous! I'm new to sewing and I have found you to be so inspirational. Keep up the good work! Gertie, do you sell your dresses? I would love to buy the last one featured in this post. Please let me know. Really enjoyed the article in 'Stitch'. Great job, interestingly informative and made me long for one of his dresses!